Available worldwide… watch the music video here! April 18, 2018 – Today Manal drops her brand new music video “Nah” showing fans a new RnB side to her talent in a song that explores the lives, loves, passions and tribulations of millennial youth. “Nah” opens with Manal and Shobee surrounded by friends facing each other in the Palmeria Marrakesh. They express the pain they experienced in their relationship as flashbacks show us a better time between them both. But are they talking to each other? Were they ever in a relationship together? Or are they talking about someone else? What follows is an artistically crafted story full of twists and turns set against a backdrop of friendships, fashion, vintage cars, pool, milkshakes and diners. On the day her debut single “Taj” nears 10 million views, Manal asks fans to spot the link between the two music videos. 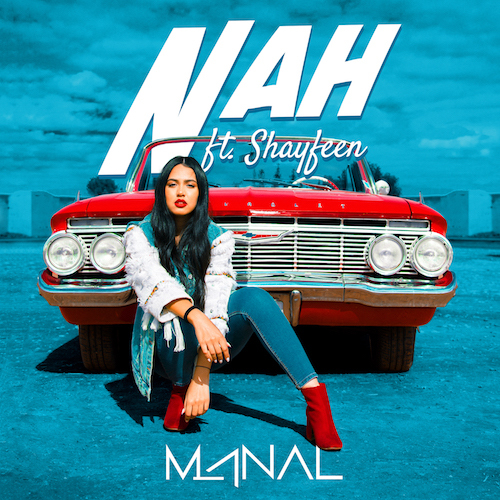 “Nah” is an infectious song featuring Morocco’s Hip-hop and Trap squad Shayfeen, one of the fastest rising stars in the region and a close creative collaborator with Manal. There is no doubt that “Nah” is set to be a radio song for the summer – perfect for summertime jams with friends and family. “Nah” is available worldwide on all platforms exclusively from Sony Music Entertainment Middle East. For all her fans across the region do not miss Manal’s performance dxbeats, Dubai Opera House on April 28 alongside Yasmine Hamdan, Sharmoofers, Wanton Bishops and Moh Flow.